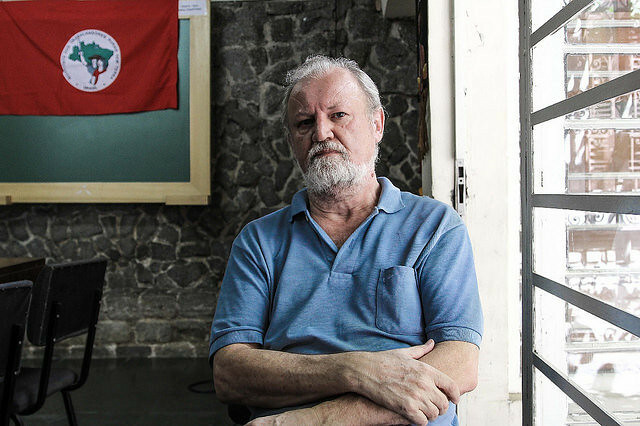 "We leave this process with closer ties and organized capacity and strength to resist this professed fascist offensive," said João Pedro Stedile, from the national board of the Landless Workers' Movement (MST) about the result of Brazil's 2018 presidential elections. In an interview to the Brasil de Fato Radio immediately after Jair Bolsonaro's victory in the runoff election, Stedile pointed out that, despite the defeat, progressive forces won politically, as a strong unity has developed over the past few weeks. In his opinion, Bolsonaro's government, which will start on Jan. 1, 2019, will be similar to the Pinochet regime in Chile in its fascist nature. "It's a government that will continuously use repression, threats, intimidation. It will unleash the reactionary forces that exist in society. On the other hand, they will try to give complete freedom to capital in a neoliberal program. However, that formula is not viable, it does not provide social cohesion, and it does not solve the population’s basic problems,” Stedile said. Brasil de Fato: What can you say to the more than 46 million people who voted for candidate Fernando Haddad, who was endorsed by the MST? We are still in the heat of the moment [after the results came out] and, first and foremost, we have to keep calm and understand the context of class struggle, and not feel defeated by this result. The ballots may have legitimized Bolsonaro, but that does not mean he had the support of the majority of the people. There is a high level of absenteeism, 31 million [voters]. Haddad had 45 million [votes]. That’s 76 million Brazilians who did not vote for Bolsonaro. Therefore, the Brazilian society is divided. Even the results of the election, from what I could see from previous opinion polls, it was clear that those supporting Haddad’s platform are the ones who earn less, between two and five minimum wages, those with low level of education. And clearly the richer and wealthier voted for Bolsonaro. But there is also a clear difference between regions in the elections. When we look at Brazil’s map of elected governors, 12 progressive candidates who won [out of 27 states] support people’s organizations, from Pará state [in the North] to governor Renato Casagrande in Espírito Santo [in the Southeast]. The Northeast and all that area in the Amazon are a hub of resistance in terms of regions, which clearly shows the people there do not want to follow the paths of Bolsonaro’s fascist project. Finally, as a brief analysis, everyone is talking about it, aside from the election results, last week consolidated a political victory for the left and people’s movements. We had numerous demonstrations of all organized forces. Unions, intellectuals, students, universities. Never in Brazil’s history have there been more than 500,000 women all over the country, in 360 cities, taking to the streets to say “Not Him,” “No to Fascism,” so I believe the analysis is that it is not a political defeat. We suffered an electoral defeat, but we leave this process with closer ties and organized capacity and strength to resist this professed fascist offensive. Despite Bolsonaro’s braggers, we know the institutions have limits. He has said that he plans to designate the MST and the MTST [Homeless Workers’ Movement] as terrorist organizations. Do you see this as a real possibility? I think Bolsonaro’s government will be similiar, if we draw a parallel, to the Pinochet regime in Chile. Not in the way he came into power, but for its fascist nature. It’s a government that will continuously use repression, threats, intimidation. It will unleash the reactionary forces that exist in society. On the other hand, they will try to give complete freedom to capital in a neoliberal program. However, that formula is not viable, it does not provide social cohesion, and it does not solve the population’s basic problems. Brazil is going through a serious economic crisis, which is the root of all this process. Since 2012, the country has not grown. And as it does not grow, as it does not produce new wealth, social, economic, and environment problems increase. With his ultra neoliberal program, where he only stands for the interests of capital, he may help banks, make banks continue to profit, help transnational corporations to hijack what is left of what we have here, but, as they will not solve people’s real problems in terms of employment, income, labor right, pension, land, housing, that will intensify contradictions. That will lead to social chaos that will allow people’s movements to go back to the offensive line, with mass mobilizations. And, deep down, in addition to what is in the Constitution – which he will not respect very much –, what will protect us is, not running to hide. What will protect us is the ability to bring the people together, keep fighting with the masses in defense of rights, of improving living conditions. And people’s mobilizations will protect our activists and leaders. Let us not be scared. The contradictions they will have will be much bigger than the possibility of repressing with impunity. There is another struggle, which is related to the elections, but has been put on the back burner since the election process started: ex-president [Luiz Inácio] Lula [da Silva]’s illegal, unfair imprisonment. What is the prospect for people’s movements for this other battlefield? We’ve all seen what happened, president Lula was kidnapped by capital through a court system that is completely subservient to these interests. He was illegally imprisoned. There are many others – not only politicians, but ordinary citizens – who remain free pending trial, as stipulated in the Constitution, which only allows imprisoning someone after their conviction is no longer appealable. In Lula’s case, it is still pending trial with the Superior Court of Justice (STJ) and then with the Supreme Court. Then they did not let him run for president when he was registered as a candidate. Other 1,400 candidates could run with the same conditions as Lula, but he was banned from running, and finally, they forbid him from speaking [with the media], while any ordinary criminal [in jail] can grant an interview to Globo [Brazil’s largest media conglomerate]. But they banned Lula from speaking to the people. Actually, they knew Lula is the major people’s leader that could bring massive forces together with the Brazilian people, and that would lead to a debate about projects. It’s clear that part of Lula’s voters, who believe in Lula, are workers who were tricked by a campaign based on lies, and they ended up voting for Bolsonaro. For the left and people’s movements, we have a huge challenge from now on, to organize people’s committees all over Brazil, organize a truly massive movement, and organize a truly international campaign for his release and his nomination for next year’s Nobel Peace Prize, as this is the campaign spearheaded by Nobel Peace Prize [laureate] Adolfo Pérez Esquivel. We are going to have a huge task to organize these committees and make this campaign a people’s banner. Obviously, there will be other challenges that we, the left and people’s movements, will have to face in the coming cycle in order to come together as it has been suggested, we have to turn the People’s Brazil Front, the People Without Fear Front, maybe bring everyone together in a People’s Antifascist Front for Democracy. It could be an even broader instrument than People’s Brazil Front itself. We have a lot to fight for from now on. This is class struggle. It looks like a soccer game in a long tournament. You lose match, but can win another one. But the key is to gather strengths and organize our people. That’s what changes the correlation of forces. How is the left after this battle? Parties, movements, Fernando Haddad himself? I was personally engaged, as well as our movement and the People’s Brazil Front, and what we clearly witnessed over the past two weeks gave us new encouragement, a new interpretation to what is happening in Brazil. A lot of people were mobilized, regardless of parties and movements, which means there is energy in society and we will be able to resist fascism. Now we cannot reduce things to parties and keep wondering what will happen with one or the other. It’s not about people. Class struggle is about class, so it’s the dynamic of class struggle that changes the correlation of forces and that will solve people’s problems. Amid class struggles, new leaders and new references emerge. We cannot cling onto these interpretations. “Haddad has the means [to run] in 2022.” “Ciro has the means.” Ciro Gomes did well in the first round, but then he threw all that away when he decided not to get involved in the political battle in the second round. Ciro’s [political] lifespan lasted three weeks. That’s how class struggle works. I think the left and people’s movements who have very specific causes, women, housing, land, unions, we have to be collected and look into things, with critical assessments and self-criticism, and restore our historical working class agenda to face the challenges of life and history. This campaign made one thing clear: we have to resume grassroots work – Mano Brown [renowned Brazilian rapper] said it and he was right. If we had had the patience, over the past six months, to go door to door on the outskirts, where the poor people live, I believe we would have had a different election result. People understand, but no one is going there to talk to them. We have to understand that what changes the correlation of forces is not a speech, is not a WhatsApp message. What changes the correlation of forces and solve people’s real-life problems is organizing the working class and the people to engage in mass struggle and solve their problems. If we lack jobs, we have to fight against unemployment. If LP gas prices are too high, we have to fight to lower them. That requires mass struggle. Likewise, the left stopped its political education work. People were tricked by the lies of Bolsonaro’s WhatsApp campaign. Why? Because there is no political awareness to know what is a lie and what was part of that game. That can only be tackled with political and ideological education. When people are aware and have knowledge, they can make up their own minds and don’t wait for anyone’s guidance. We also have to further strengthen the beautiful work you do here at Brasil de Fato, with a radio station, newspaper, compact newspaper, online. Strengthen our people’s outlets. Now is the perfect time for it. Finally, we have to start a new conversation in the country, about a new sovereign project for an equal, fair society. Because this campaign was based on lies and on the fight against lies, we did not talk about platforms, we did not talk about a structural project for the country. Now we have to bring that converstation back, and rebuild, over the next months and years, a people’s unity around a project. A platform of solutions for the people, because the government will not do that.